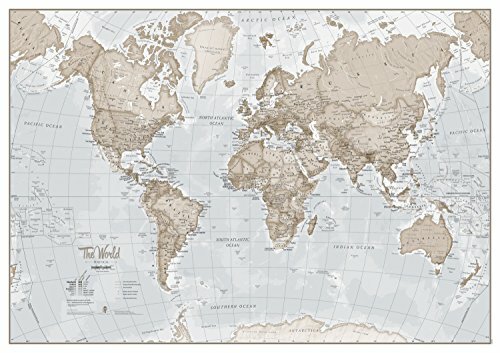 Map of the World Art print in neutral tones designed for the color schemes in your home. Map details: Created for the stylish wall space in your home, these maps are sure to impress. Map of the World Art prints features major towns and cities and also contains hill and sea shading. Completely up-to-date: The map is totally accurate and includes all recent developments in the World, in particular the new country of South Sudan and the new international dateline. Designed by specialist map makers, our team of cartographers create beautiful maps. So detail as well as design is what we do best. Our philosophy of 'good cartography' is what we hope people will love and appreciate. Paper: Our Silk Art Paper is a superior color reproduction finish and provides high photo quality results. Packaging: Comes rolled in a tube. Beautifully styled up to date world map underneath. If you have any questions about this product by MapsInternational, contact us by completing and submitting the form below. If you are looking for a specif part number, please include it with your message.